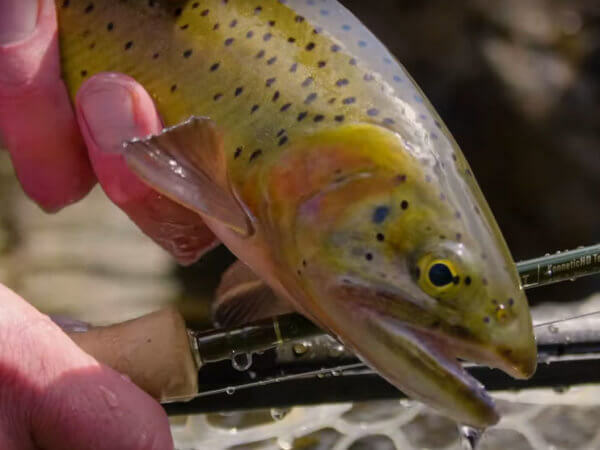 The Scott Flex 854-4 is a wonderful all-purpose light line rod, equally capable with light nymphs as with a dry fly. FX 854-4: This is one of the most important rods in the series, and Bartschi nailed it. Like the 5 and 6-weights, this is a medium-fast action rod, but the tip is sensitive enough to load with a natural, gentle casting stroke even with very little line. Casting this rod from 15 feet to 50 feet is a pleasure. Loop control and touch are matched by line speed and command. Line pairings: Rio Perception or Gold, SA MPX or Trout tapers. The Scott Flex 855 sports a very light swing weight and an extremely light in the hand feel. It threw great loops off the tip that were parallel, predictable and flat. This is a very pleasant rod to cast and it is very accurate. Slightly more playful in my opinion than the 905 this rod is a top choice for fishing dry dropper rigs in tight places or in tight quarters. A much more refined rod than its predessor, the A4 855.